The smell of burned human flesh is a persistent thing. After it has seared itself into your nostrils, it then etches itself into your mind. It may slip into remission for decades, and then something will happen to bring it back to life, and you smell it again. Truth be told, it never really goes away. It was the first smell that greeted our salvage team as we stepped aboard the USS STARK (FFG 31) and, with each breath, it told us an acrid tale of horrific suffering, paralyzing fear, and tragic death. It was the story of thirty seven sailors who had died in a storm of burning phosphorus and molten aluminum. They breathed their last torrid breaths in a real-world hell that no biblical description could ever do justice – and they did so serving their country. On 17 March 1987 the USS STARK, a US Navy guided missile frigate, was on patrol in the Persian Gulf. Its task was to ensure that the Iran Iraq War did not close the gulf’s shipping lanes. It was a mission that they had conducted many times. Watch stations were manned according to doctrine, dinner had been served, and many of the crew were hitting their racks so that they could get up for their early morning watches. It was, for all intents and purposes, a routine evening. 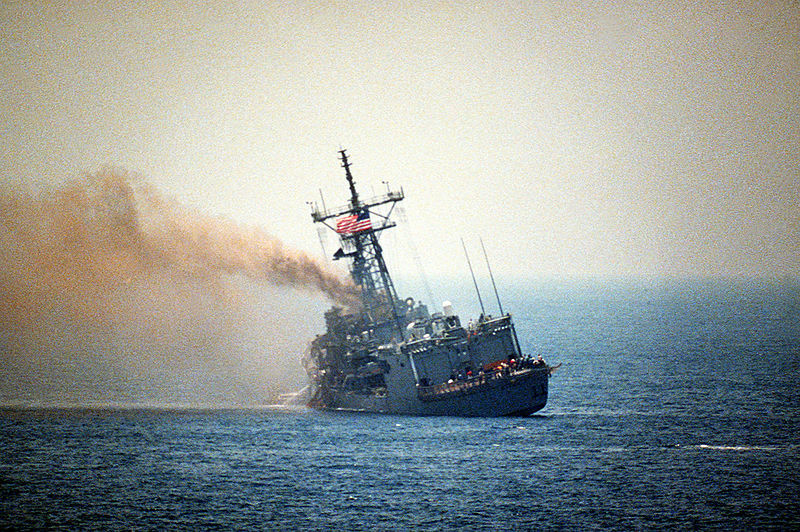 That all changed at around 8pm, when an Iraqi Mirage mistook the USS STARK for a hostile target, and attacked it with two French made Exocet anti-surface missiles. The Exocet missile is an extremely lethal weapon. Fired from either an aircraft or a ship, it skims below radars at about 12 feet over the water at speeds reaching Mach 1. It is designed to penetrate a target before detonating its five hundred pound warhead to ensure maximum damage is inflicted. Though the USS STARK had systems on board that could defend against such a missile, they neither detected nor engaged the inbound weapons. Shortly after 8pm, the first missile struck the USS STARK below its port bridge wing. It ripped into crew berthing where, just seconds earlier, dozens of sailors had been peacefully sleeping. 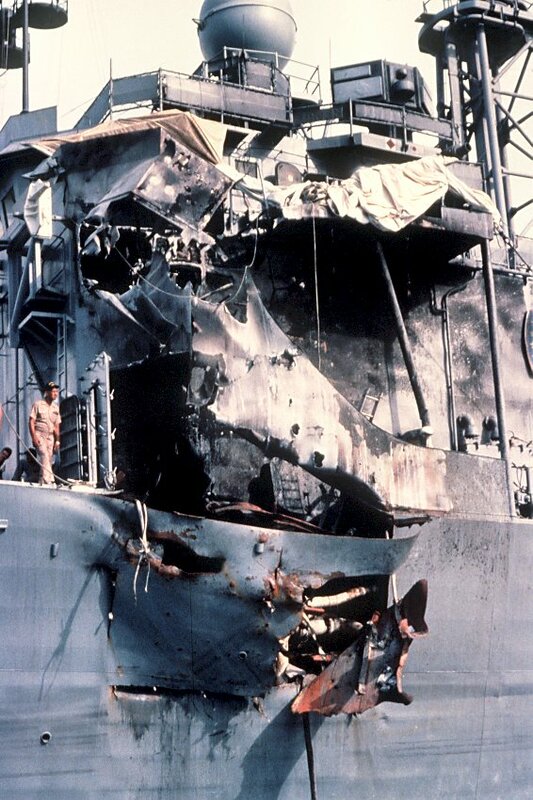 Its warhead failed to explode as designed, but as the missile tore through the ship’s internal bulkheads, it broke into hundreds of pieces sending shrapnel and burning phosphorus-based fuel in all directions. The unexploded titanium encased warhead cut through the interior aluminum bulkheads like butter, eventually coming to rest on the starboard side. About twenty seconds after the first missile hit its target, the second Exocet entered the ship just forward of the first strike. Unlike the first missile however, its warhead exploded devastating the interior of the ship. Those that were able to get out of berthing before the second strike were lucky. For many of those wounded in place or unable to escape however, death would come in its most horrible form – fire. By the time we arrived on the USS ACADIA (AD42) to conduct salvage and repair operations, the fires were long out. As a junior officer, I led a small boarding party to survey the damage. 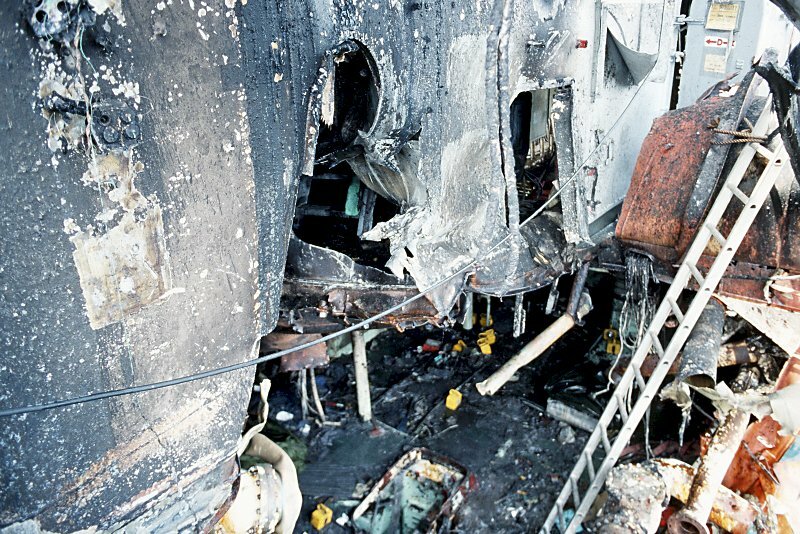 The decks were so fragile from the phosphorus fueled fires, we had to pound the deck in front of us with a steel rod to ensure it could support our weight. Death had paid an uninvited visit to the USS STARK and, days later, its presence was still clear. It sucked the wind out of my lungs, and made me want to hold my breath and run from the grim reality in front of me. It made one wish for clean air almost immediately; clean air that thirty seven sailors would never again breath. It is this very spirit that makes us who we are as a people. We can be damaged, but NEVER defeated. We are the mightiest force for freedom and human dignity the world has ever known, and no missile or bomb will ever change that fact. We rise when other nations fall. We defend and liberate those that others oppress and torment. We are a force for good and, as long as we remain so, we will endure – against all odds. This was the message that the USS STARK sent the world. Sadly, the USS STARK no longer sails the world’s seas. 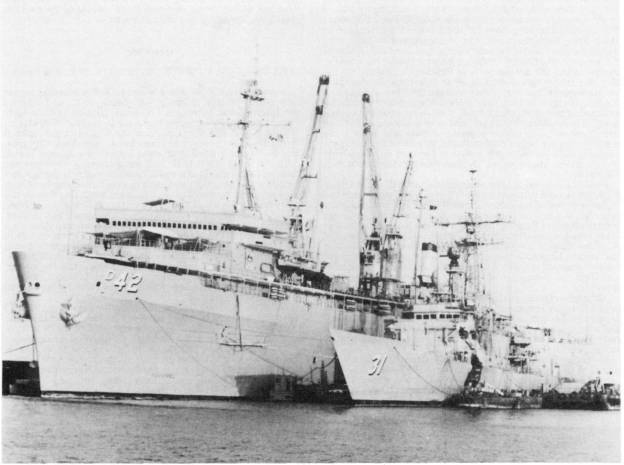 Years after the incident she was decommissioned, and quietly cut to pieces in a shipyard. Though, she is no longer with us – her spirit remains in the hearts of those she touched. Each Memorial Day, I stop to say a prayer of gratitude for those who perished on that fateful day, for without brave men and women like these, our nation would be nothing more than an odd footnote in world history. I then remember the smell. After all these years, it still serves as a stark reminder that our freedom comes at great price. It still haunts me to this day…and I pray that I will never forget it. Head Muscle salutes all the men and women who faithfully and fearlessly wear the cloth of our nation. God bless and Godspeed. This entry was posted in Life, WordPress Political Blogs and tagged America, Bahrain, casualties, dead, Exocet, heroes, memorial, Memorial Day, Military, missiles, Navy, patriots, Persian Gulf, remember, sailors, Stark, USS ACADIA, USS STARK, veterans by Chuck. Bookmark the permalink. Chuck, you have done a great thing, here. So many members of the U.S. military have made the ultimate sacrifice while not involved actual combat operations (training mishaps, accidents involving lethal equipment, hostile “incidents”, etc. ), and with little or no recognition. I can vividly recall the tunnel incident on the DMZ in Korea when I was stationed there in the mid-seventies that resulted in more than a dozen U.S. deaths. Thank you and God Bless for focusing our attention where it should be on this day of remembrance. You have a most valuable gift and I am so glad that you choose to use it. It is easy to sing the praises of those who achieved glory in battle, but we must not forget that many others pay the ultimate price as well. Our men and women of the armed forces are in danger every day they go to work, no matter where they are. If anyone thinks that I am over dramatizing, I would like to refer them to Ft Hood. Thanks as well for your kind words and for your service. Excellent post Chuck. All too often the people that do the sacrificing are simply forgotten. I just happened upon this while looking at info on the USS Stark. It was a beautiful remembrance to the crew of that ship. William Hanson was a neighbor and close friend of mine and even though I was in high school I still think about him all the time. Seeing this post made me remember how nice he was to me growing up and I will never forget him. So many people forget the sacrifices the men and women of the military give. I am one who will never forget. Thanks for stopping by and taking the time to read. Please come by anytime. I’d also like to remember William Hanson. I’m 98% sure he’s the same guy who I attended basic training with (C-257, NCT Orlando, 1984). He and I really got along well during basic, even though he moved into our unit to complete training after being sidelined with (I believe) appendicitis. He was both smart and considerate. I recall that we had some great conversations, and he was cool to hang out with. We didn’t stay in touch…he went to fire control school, and I ended up at Miramar as a PN. He was a fine man. It’s a loss to the world that we never found out what more he could have become. I don’t know if he died instantly, or if he died in the fire, or in the fight to save the ship. If anyone could tell me, I’d appreciate it. I went to highschool with bill hansen. He was a good man. What a sobering story. Thanks for reminding us what the millitary faces everyday. I remember bill as a kind man who would say hi whith a smile on his face. Jim, if you’re monitoring this…please contact me (I clicked to get notifications via email if anyone replies to my comments).